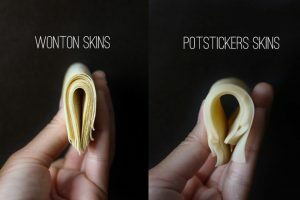 Before we get started, I wanted to show you the difference between a wonton skin and a dumpling/potsticker wrapper. 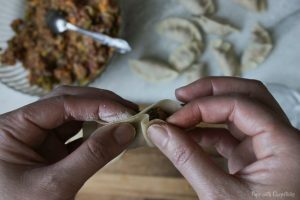 Potstickers are usually the ones that are folded and pleated more fancy than wontons and they have a completely different texture as well. When shopping for these 2 ingredients I find the no-fail best way to tell the difference between the two types of skin is to use the ‘bend test’. 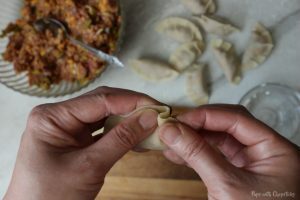 Wonton wrappers are very pliable and blendy, whereas dumpling wrappers are a bit doughier are harder to bend in half. 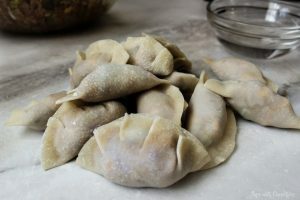 Wonton wrappers are also more yellowish in colour and generally have eggs in it, whereas dumpling wrappers are more white and pale in colour, and have a doughy texture and have no eggs in them. Start off by pinching the middle together. 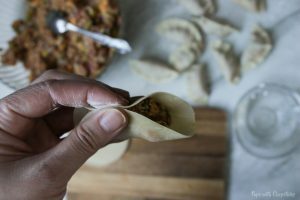 The pros start at the edges but I have always found it easier to start in the middle and work your way down to the bottom on both sides. To create the pleats, work on one side at a time and pleat just the skin facing you, then pinch the pleat onto the back of the skin to secure. Repeat that until you get to the bottom. How many pleats is your preference, I usually just do 2 per side. Repeat Step 3 on the other side, starting from the centre again. 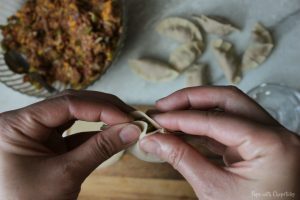 Fold the skin in half and pinch to secure the whole thing. Technically, you can stop here! 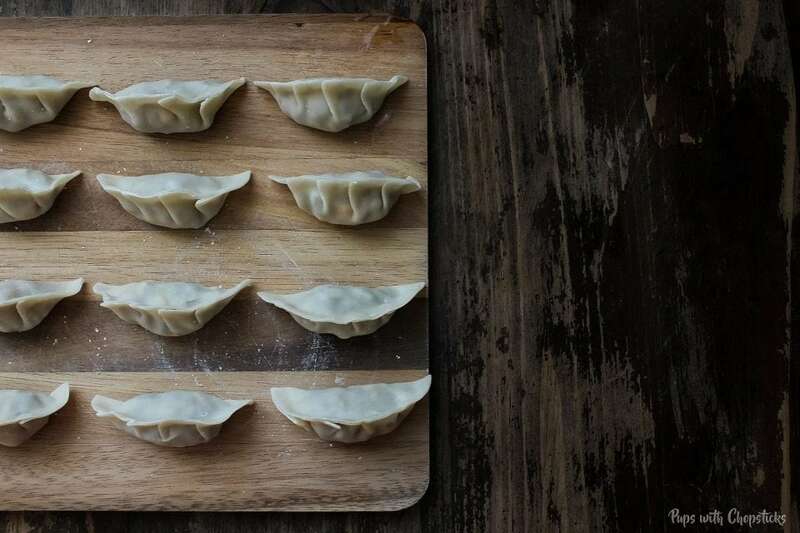 🙂 and this can be the simplest form of folding a potsticker. However if you want to have pleats on them, go on to step 3. There’s nothing to it 🙂 and I can confidently say that after you have done it a few times you will probably be a pro at this and do it in your sleep. What a great post! 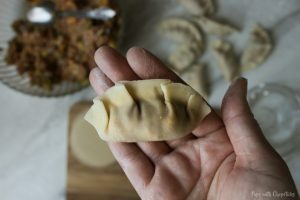 So helpful and I was actually able to make my own potstickers! Thanks for this post. 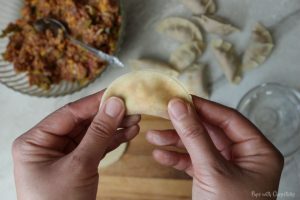 I have a potstickers recipe that I make sometimes but never fold them nicely. Next time I will follow your instructions.